Next ›Video walkthrough of Sari Dalmatica/Delmatikion! I think, even if you are not active in Jacksonville, the idea that you CAN be active will at least help. Just knowing that it’s there. I wish I could wave a magic wand and make the Navy do what’s right. Since I can’t, if you are at Pennsic, I will bring you alligators. I too have a diagnosis of clinical depression with anxiety. You are brave to put all of this out for people to know about you. And you are on the journey that poses a difficult challenge for women like us….asking for help. Be open to it, keep doing it. When we allow others to help, the gift goes both ways. Be gentle with yourself. It sounds like you’ve been on the hamster wheel of chaos for a long time. The harder and faster you run, the faster it goes. After awhile it feels like the new normal. Don’t fall into that trap. Talk to the professionals, do the self care stuff, take time for you. I’ve been on that hamster wheel and it was difficult to step off. Relinquishing what I thought was control was rough. In retrospect I was just trying to keep up and was doing so badly. You’re the only “you” that you have. Treat her as well as you treat the things and people you care about. You’ve made a difference in Caid, and I truly want you to know that. You’ve made Byzantine life and material culture accessable to many. Don’t ever discount your contributions…you do them with heart! IF there’s anything we can help you with up here in NH, please let us know. With enough scheduling, we could mail stuff for you from your storage locker if needed. Unfortunately, it’s our big pavilion and trailer. Not exactly “if it fits it ships”. Thank you so much for sharing your life. You are an inspiration to those of us who are just about to look for help with our own mental health and life chaos. And I for one can’t wait to see the Alligator coronet. What a hard time for you. I tend to believe that we all have some degree of PTSD, especially from losses in our lives and losses of identity and loss of what we want to be and to have exist. I have had a similar sort of thing for a while now, and moved places I didn’t want to and was ill etc. Good for you for figuring out things that feel good. I wish you the best. 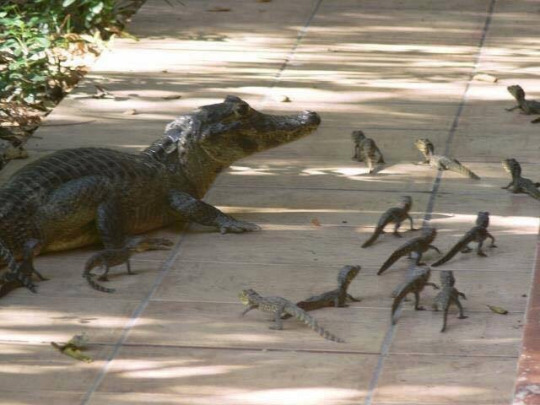 And i never saw baby crocs or alligators before–are those real? Those are definitely real! 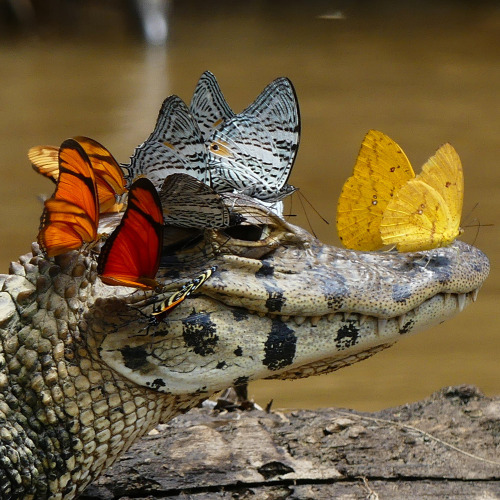 The first picture, with the butterflies, is actually a caiman, which is a cousin that lives in the Caribbean and South America, but the babies with the mother are 100% real. The hatchlings stay with their mother until they’re about 3 years old, and start out quite small and cute. They are genuinely cute, at this distance!